Virtual Programming on Wednesday announced the release of The Abbey, an adventure game for the Mac, priced at $20. It’s available for purchase and download from VP’s Web site. In The Abbey, you guide Leonardo and his assistant on a quest to solve a murder. The Abbey is a classic point-and-click adventure game, and a mystery story penned by Emilio de Paz. You guide Leonardo de Toledo and his assistant Bruno through a medieval abbey as they seek to discover the truth behind a murder. 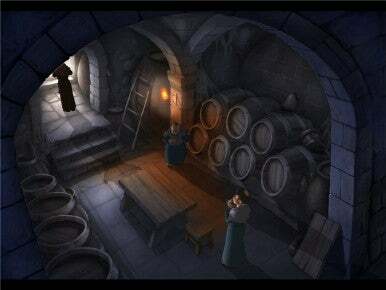 The game combines 2D and 3D graphics, and promises about 20 hours of game play as you explore the abbey, find secret rooms and passages, interact with the monks there, and try to get to the bottom of the crime. The Abbey features Dolby Surround Sound support and more than 70 minutes of music played by the City of Prague Orchestra. System requirements call for an Intel-based Mac, Mac OS X 10.4.11 or later, 512MB RAM, GeForce 7300, Radeon X1600 or GMA X3100 or better 3D graphics, 3GB hard disk space.